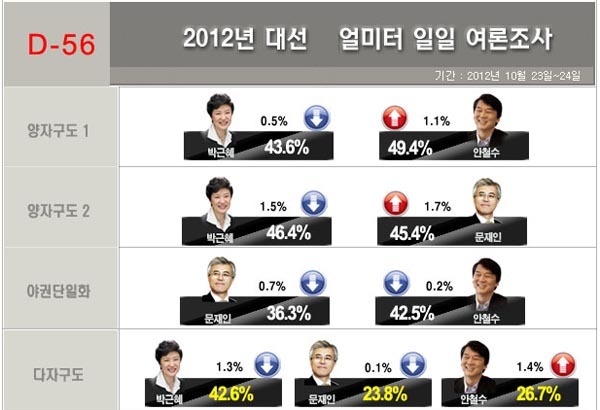 Latest Korean presidential opinion poll shows Ahn Cheol-soo at 49.4% and Park Geun-hye at 43.6% in a 2 horse race. Assuming the 7% don’t turn up to the polling booths it’s a win to Ahn. If the 7% do turn up to the polling booths Park will need 6.4 percentage points of undecided voters. i.e. 92.9% of undecided voters … not going to happen. Alternatively, Park Geun-hye at 46.4% and Moon Jae-in at 45.4%. Assuming the 8.2% don’t turn up to the polling booths it’s a win to Park. If the 8.2% do turn up to the polling booths Moon will need 4.7 percentage points of undecided voters. i.e. 57.3% of undecided voters … not going to happen. Time for Moon to decide to be a statesman as Prime Minister of the Republic of Korea, or to run for Mayor of Busan.